RESALE went online in 1996, making it the oldest used machine market worldwide. Since then we are constantly working to further increase the functionality and visual experience of our website. Subscribe without obligation to our newsletter and receive weekly new listings by email. Our latest machinery entries are also available for our magazine. You would like to advertise in our magazine, then contact us. High acquisition costs and short life cycles: Used machines are becoming increasingly important for companies, regardless of the size of the company. Especially when a device breaks down in the production process and time is running out because a production stop threatens, used machines turn out to be a real alternative to new devices. But even if you want to expand your machine park, so as to increase the efficiency even further, second-hand goods become a great alternative compared to a new machinery. Whether printing presses, agricultural machinery or packaging machines: Not only are used machines more affordable, they are also quickly available. In addition, they can often compete with new equipment in terms of quality. You require metal working or woodworking machines and are looking for suitable used machines? Or do you have a construction machine or paper processing equipment that you would like to sell? 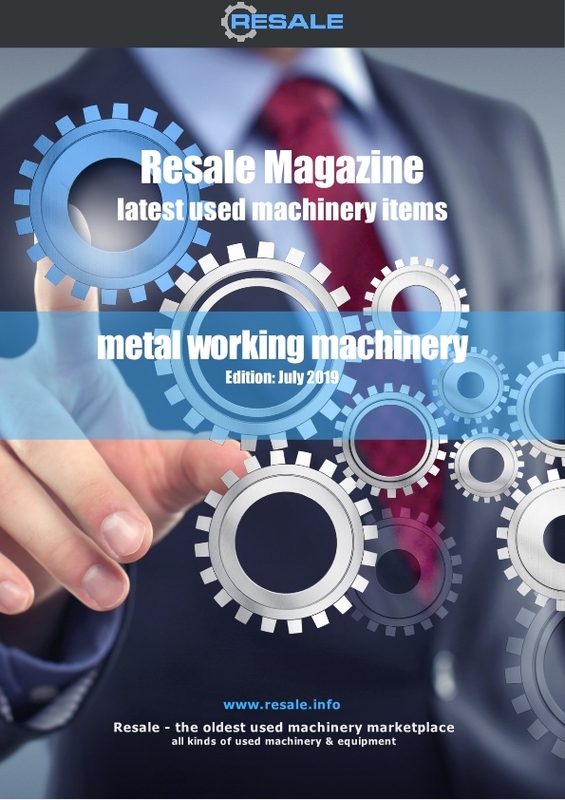 RESALE is the oldest used machine marketplace worldwide and brings together suppliers and sellers. As the first second-hand machine marketplace on the Internet, we went online in 1996 and have since defied numerous imitators. We only provide the platform for sellers of used equipment - but we do not offer any products for sale. Machine tools or printing presses: at RESALE you will find machinery from well-known manufacturers at fair prices. As a leading used machinery platform for numerous machine industries, we offer more than 100,000 used machines and equipment as well as more than 20,000 registered sellers. You can buy used machines at resale.info for a fixed price or you can win the bid in an auction. We ourselves keep our costs low by efficient work and can pass these on directly in the form of favorable prices to our customers. In addition, you can also browse our dynamic subcategories. If you do not discover what you are looking for in our used machinery marketplace, you can also submit a wanted inquiry.